... for less than $50! Here's how to get all your stuff off your workspace and neatly organized. The prices in parentheses are what I found at the home improvement store where I shop. Set out your tools and embellishments so you can see what you have and get a sense of what kinds of things you are attracted to. For example, if you use a lot of decorative scissors, make a note of that. If you use lots of small metal embellishments, note that. If you have more buttons than is at all necessary (who, me? ), note that. Now look at how much wall space you have that you can dedicate to your "scrap wall." Keep in mind that you don't want your wall to go too high because you'll never use that space at the top. Make a general list of what you need to get at your friendly neighborhood home improvement store. You will be shopping on the aisle that sells all the little doohickies that go on pegboards, so think about three basic things: hooks, bins, and jars. a. Hooks: You will find short hooks (great for scissors; $2 for four), medium hooks (great for die-cut frames and for extra rolls of adhesive; $2 for two), and long hooks (not great for scrapbooking because you'll never use what is in back). You may also want to hang things up on your board in their original packaging. This is a fantastic way to keep things visible so you'll use them, and to feel like you live in a scrapbook store. But I would be careful about stacking different things too deeply because in my experience, what you don't see, you don't use. b. Bins: The bins are my favorite because I can see what's in them, they go on and off easily, and I think the size is ideal for our purposes. I use mine for charms and shapes, anything with a word on it (metal, acrylic, etc. ), glitter, the number stamps I use all the time, my new jet-action eyelet setters, bottle caps, etc. And at a whopping $1 apiece, how can you go wrong? c. Jars: I have a button problem. I love them, I buy them, I salivate over them, and I blaze through adhesive dots on them. The pegboard jars are marvy for buttons, metal letters, and that sort of thing. What is so great is that the lid is the part that hooks onto your pegboard, so you just unscrew the jar and lower it off. Like the bins, the jars will set you back all of $1 apiece. Dig it. d. There are a few other nifty things on the pegboard aisle you might find useful. There are bins with drawers that pivot down ($2 apiece). This might be good for something less prone to spilling, like say, hemp or ribbon. You will also find a big "Tool & Parts" tray ($4 apiece) that offers bins and holes that would be great for lots of decorative scissors. Don't forget the actual pegboard. They sell it in at least two sizes: 2x4 ($3.50 for white, $3.00 for brown) and 4x8 ($13.88 for white, $10.88 for brown). Most stores will cut wood for you for a small fee, so if you need a size that is in between what they carry, don't dismay! Just have them cut a big one to size for you. Also, if you don't want white or brown, spray paint is available in an astonishing array of colors, so knock yourself out! Shopping tip: Buy a few extra hooks and bins so when you get your order from A Cherry on Top, you'll have homes for all your cool new stuff. Before you go home, stop by whatever craft and home décor store you have the coveted 40% off coupon for. (For those of you who are new to this, look in the newspaper for flyers for craft stores, and you are likely to find a coupon.) Once you get there, go to the unifinished wood section and find some sort of shelf, ideally with something from which you can hang a dowel. Figure 3 shows what I found, which is for whatever reason called a "Mitten Box." It should have been called "Jennifer's Perfect Scrapbook Area Box" because not only does it give me the shelf space on the top, but it opens up for more storage (I keep extra ribbon and stamp pads inside), and it has a place where I hung a dowel off of two picture hangers on the bottom, giving my ribbon spools the perfect home! I also screwed the tops of six baby food jars to the underside of the shelf so I could put embellishments in the jars and store them right under the shelf. Most of our dads adopted this method in their workshops. As you can see, I didn't even bother painting it before I stuck it on the wall and jammed it full of stuff! The Mitten Box was normally priced at $25, so with my coupon, it was $15. Not bad for a place to store ribbon, embellishments, all of my stamp pads, and miscellany on top. Once you get home, it's the fun part. Hang your wooden shelf, and mount the pegboard on the wall (be sure it's secure), and figure out the best place for everything. Be sure to leave room for hanging things to clear without bumping into anything else. And be sure that the things you use the most (like your scissors) closest to you. I would suggest keeping most of the bins low so you can see inside them, unless you want to label them in some way. Try not to stress out too much about where you put everything. A major reason this system is so great is that it is so flexible and changeable! There are some other inexpensive ways to get all your goodies organized. A lot of scrappers use tackle boxes for all their embellishments. They are great because there are so many little compartments for everything from eyelets to labels, and you can put your tools right in the bottom. Plus, they fold right up and are great for taking to crops. They start at $10, so it's a great solution. Other scrappers use revolving spice racks to organize embellishments (you can see exactly what's in them), or ribbon (just drill a hole in the lid and pull the end through). These can be a little pricier, but with patience you can find a deal. If you use a lot of 8-1/2x11 card stock, you can't go wrong with plain old office paper trays. You can get 6 for about $10, and they don't take much workspace because they go vertical. I also found a little caddy (see Figure 4) at a craft store that is great for crops or when I am going to work in another room in the house. I can easily put in my essentials, carry them around, and keep them handy. The caddy set me back $1. I hope that you are equipped and inspired to go forth into the Land of Clutter, conquer it with a small budget and a solid plan, and claim your scrap area as the Land of Peace and Relaxation it should be! Good luck, have fun, and let me know how it goes! Jennifer Bussey is a stay-at-home mom and freelance writer. She has been scrapbooking since the arrival of her first child almost four years ago. Scrapbooking quickly became much more than a hobby, allowing her to use an exciting creative outlet to make one-of-a-kind time capsules of her growing family. Jennifer has been married for nine years to the best husband and father a girl could hope for. For many scrappers, back-to-school means back-to-scrapping. While the kids are plugging away, stuffing their heads with science, math, literature, and the latest dish, moms are at home facing that mountain of scrapbooking stuff that accumulated over the summer. If this is you, it's time to get things in order so you can start posting some numbers of your own! As you gaze across the photo developing envelopes, the shiny wrappers of unopened stickers, and a falling stack of refill pages, your gaze falls on all those little packages of embellishments. Metal letters, themed brads, tags, spools and spools of ribbon, tiny bags of eyelets, epoxy words—the list goes on and on. Is there anything in our scrap stash that brings us such joy upon purchase and such anguish at a crop? Well, it's time to do something startling. It's time to… use them. Up. Here are five tips for getting those embellishments onto pages, where they will bring you joy and delight instead of frustration and confusion. You bought them because you loved them, right? So, let's see what we can do to help you actually use them. Make them accessible and visible. You're unlikely to use what you can't see, and you definitely won't use something you forgot you even had. So, based on your scrapping style (not scrapbook style, but your working style), figure out the best way to keep your embellishments where you can see them, mix and match them, and even be inspired by them. Ideas include spice racks, tackle boxes, baby food jars, watchmaker cases, baggies, etc. This doesn't have to be expensive, just efficient. Reverse the decision-making process; work backwards. This has changed my life. Where I always used to choose which pictures I wanted to scrap next, I now sometimes choose which product(s) I want to use next, and then find the pictures to go with them perfectly. Since I use post-bound albums, I can work out of order when I need to, and since I'm going to get to all of my pictures eventually, this can be a very liberating approach. Assemble mini-kits. You may be one of those highly organized people who put together your own comprehensive page kits for your pictures. If so, I envy you! But if you're like me and can't make that many decisions in advance, consider making mini-kits with your embellishments. Maybe you noticed that your new alphabet labels go great with some page pebbles and a charm you've been waiting to use. Go ahead and put those things together so that when you have pictures to go with them, your layout process is accelerated. It's so much easier to get on a creative roll when things are coming together, right? It's hard when you're stuck, and this can help. This doesn't have to be a major undertaking (although playing with all your "toys" is fun! ), just take a minute when you happen to notice that things go together, to store them together. You might even keep a box of snack-size baggies near your supplies for this very reason. Tip: If part of your mini-kit is an alphabet (metal letters, labels, monograms, stickers), just put one letter in your kit to remind you that you wanted to use that alphabet. Either use one you know you will need, or use something like "x" or "q" that is unlikely to be missed. Tip: Prioritize the embellishments you just bought. Using stuff you're really excited about makes scrapbooking more fun and satisfying. Trade or donate. If you overbought a certain type of embellishment or your style has just changed, trade with another scrapbooking friend or donate to a local school, library, or children's hospital. There are plenty of worthwhile places that engage children in craft activities, and they'd love your cool scrapbooking embellishments. Don't be afraid to use the last one! Unless you want to be the worst kind of pack rat, make it your goal to use embellishments UP! That's right. Don't save the last one or two "just in case." New products are coming on the market constantly, so make peace with the fact that there will always be another perfect embellishment for your "just in case" scenarios. Buy embellishments, use them, and use them up. Take a deep breath and chant, "Use them up…use them up… use them up…" Tip: If you just can't help yourself, have a separate place where you put embellishments when you're down to three or so. In an emergency, you can check that stash. Then if you find that you never actually use anything from that stash, you can go ahead and toss them out. Try one or more of these ideas to help you put your embellishments to work for you. There's no need to let them amass in your crop space to the point that you are overwhelmed by indecision. You don't have to live in fear of being buried alive by an avalanche of small pieces of metal and plastic. And just think, the sooner you use up what you have, the sooner you can buy more without all that pesky guilt. Going Digital? Read this first! Digital layouts are one of the hottest trends in scrapbooking right now. And with more and more websites dedicated to digital or adding digital sections, I don’t think this is a trend that we’ll see fading anytime in the future. But there is a bit of mystery surrounding digital layouts. When you ask people about digital scrapping, many are like “What is digital?” or “I wouldn’t even know where to begin.” Hopefully, this will give a little background into the digital process, what’s needed to get started, and what digital can offer to your scrapbooking experience. What is a digital layout? Digital layouts are layouts built with the use of a computer. 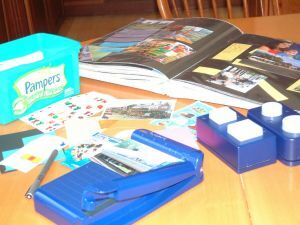 There are a variety of ways to use your computer in scrapbooking, such as computer-generated journaling, altering photographs with software (see example #1), and scanning elements to add to your pages. Chances are, you’ve probably got most of what you need to get started using digital scrapping. The full-blown digital layout is completed using your computer to generate your entire layout including cardstock, patterned paper, alphabets, and accents. You can do this in one of two ways: 1) Designing your own elements, or 2) Creating with pre-made kits. Will digital layouts fit with my style? A little background on my digital experience…I had first seen digital layouts a couple of years ago when I started scrapping. While they were bold and different, they were a little too different for me…a bit too contemporary, too graphic, and too edgy. The few that I liked had more of a traditional paper-like look to them. But when a friend, who had always been a traditional scrapper, posted her first digital layout, I had to do a double take (and a triple, and quadruple LOL). If I hadn’t known better, I could have sworn it was a paper layout. So, I decided to make the leap and try digital. I figured if I didn’t like it, I could always just chalk it up to trying a new technique. My mother’s words echoed in my head, “one bite won’t kill you!” Now, dozens of kits and much less space on my hard-drive later, I’m hooked. Although I will never go 100% digital, I love the options that digital can offer. I quickly discovered that, just like traditional scrapping, there is an assortment of styles available to the digital scrapbooker. If you pick up a magazine, chances are you will find some digital layouts in there. There are online galleries also available to browse through to see what styles grab your attention. Do you like bold, graphic designs? Soft and dreamy? A more traditional look? All of these styles and more are available to digital scrappers. Plus, more and more designers are making their images look so realistic that it can be hard to tell they’re digital. There are a wide variety of techniques to try whether you’re a beginner or advanced. It just takes the willingness to learn something new and some practice. In the beginning, I worked with my elements as they were designed with just a little bit of resizing. Now that I’m comfortable with the process, I’m trying my hand at some new techniques like cloning out words to replace with my own, re-coloring elements to go better with my pictures, tearing pages, and using brushes and filters (see example #2). Just like in paper scrapping, some techniques take a little longer than others, but with practice it doesn’t take long before you get the hang of things. Another great aspect of digital scrapping, there’s always the “undo” button! While you’re working, nothing is permanent! You’re not limited to a particular size photo, you can have them as big or as little as you want. Text anywhere and everywhere in whatever shade you desire. No more printing on transparencies to place over your page. Just position your curser and start typing. You can also conveniently use white text too! No mess…no sharp scissors just begging your two year old “run with me!” No little blue tabs littering the floor, no having to clean up before you can start another layout. Shop, visit online galleries, chat, and do layouts at the SAME time! I always have multiple windows up and click back and forth between them. New mommy’s can hold a baby, nurse, whatever with one arm, while they’re designing with the other. Try that with paper scrapping…not fun! Considerably cheaper…try getting everything that comes in a $5-6 kit at your lss. Flat pages…there are so many great embellishments now, but if you don’t want a lumpy page, digital elements will give you look with no lump! Resize a layout to make quick and easy announcements or invitations. You can make this hobby, whether it’s paper or digital, as expensive or inexpensive as you like. Unlike traditional scrapping where the majority of products come out after trade shows like CHA or Memory Trends, the digital designers produce kits on a monthly or even a weekly basis, so you’ll never be lacking for kits. The key is to get the most for your buck. Here’s are a few things that you’ll need to get started. Photo Software: I prefer Adobe Photoshop Elements 3.0, but there are number of different packages that can do basic functions to advanced functions. Scrapbooking magazines are considerably helpful because they frequently highlight photo software, digital cameras, scanners, and printers. They’ll give you a breakdown of important features, system requirements, and price. Researching will help you find the software that will best fit your needs. Helpful hint--Buy around gift-giving times to get the best value! Digital Kits: More and more sites are popping up that have digital kits and elements and some of them offer FREE stuff! You could try your hand with a free kit to see if you like the process of digital scrapping and you won’t be out any money. You also have the option to buy kits (I’ll talk more about these below). Scanner: Another item that you may have, but is not a necessity unless you want to scan in your own items (artwork, medals, clothing, etc.) Helpful hint—This is another item that would be wise to buy around Christmas when sales and rebates are offered. Also, some of the brands come with photo software like Adobe Photoshop, so you basically killed two birds with one stone! This can be a great value. When I say kits, I mean you get the whole kit and caboodle…cardstock, patterned papers, alphabets, accents, fasteners, stitching, overlays, stamps, ribbons and trims. Some have more than others, not all kits will have everything. If you bought all of it in the store, chances are you would go over the usual price of $5-6 dollars per kit. Not bad considering that you’ll never run out of your alphabets or paper, and can use them on more than one layout. Most designers do a great job of staying up on the latest trends, so you can find the newest color schemes and hot patterns, transparencies, epoxy elements, chipboard embellishments, and cool fonts. There are some designers who sell components separately so you don’t have to pay for the entire kit, but just what you want. They may also be offered in CD collections. It’s standard to get all of your elements 300 dpi (dots per inch) to fit on a 12x12 page. You can resize as necessary. Look for kits that have elements that you can use on a number of layouts so you get the most bang for your buck. There are a plethora of kits out there in all different colors and themes, you just need to go online and browse. Also, remember that with some practice, you can learn to change the colors of your elements, so if you have a pink set that you just really love, but have a boy (like me!) you can change them and they can go either way. Some designers are also starting to design kits with both masculine and feminine colors in both. OK, I’ve got everything, now what? The first step for me was the hardest. I just couldn’t figure out how to do layers, but once I realized what I was doing wrong, it’s been smooth sailing ever since. There are excellent how-to articles available on the Internet and in magazines/idea books. It will take practice, but once you get the hang of it, it’s pretty easy to do a basic layout. Helpful hint—purchase a reference book that goes with your photo software. There are tons of things that you can try, but often don’t know about them. Online message boards are also a great way to get answers to your questions. If you’re stumped on how to get started, find a digital layout that you like and copy it. This will help you get the logistics for all of the functions down without having to worry about the design yourself. In the end, if you have some of the equipment, trying digital doesn’t have to cost you very much. It’s a new technique that you can say you’ve tried and even if you don’t like it, you’ve walked around in someone’s shoes and know what they’re talking about. There are some that have a definite preference for one or the other, but many scrapbookers are finding that the two can mix very well. In fact, one trend that is emerging in the digital world is mixing a little of both. Design your page with the key elements (paper, title, journaling, pictures), then just print it off, then add traditional supplies for your embellishments. 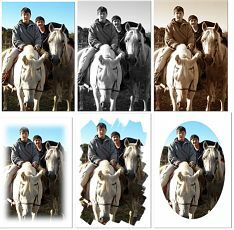 You get some of the options that digital offers, with the texture and dimension that traditional scrapbooking offers. You don’t have to pick one or the other, just enjoy the best of both worlds! How-To Links: A quick search will find you a lot of websites. I use these two the most. Digital Websites: There are a lot of places where you can get digital kits. I’m a repeat customer of all of these shops/designers…quality kits, wonderful customer service. Lindsay is a full-time working mother of two little boys, who are frequently seen in most of her layouts. She began scrapping after the birth of her first child in 2003. Trying to keep up with a very active toddler and newborn, she first began digital scrapping six months ago and hasn't looked back since. Enjoying the best of both worlds, she's always on the hunt for the latest and greatest products (paper or digital). She's proud to be a member of the ACOT Design Team since August 2004 and enjoys sharing new techniques with the ACOT community. When she's not scrapping, she enjoys spending time with her husband, playing with her boys, photography, reading, and shopping! The Design Team went crazy with chipboard and foam stamps in this month's Design Team Reveal! Can anyone say, "Wow?" Adhering it, Using it and More! Help! I’m organized and I can’t find a thing!!!! Crop and Class Maven, Trendy Tracker or Mighty Hoarder? Technique Freak, Power Scrapper or Paralyzed Perfectionist?